For less than 25 bucks*, ensure uninterrupted power supply to your CCTV system . A simpler solution and more efficient than the best UPS in the market. And with 10 hours of battery life! * Cost of batteries not included. Do I need to install an UPS? Any security system (CCTV, alarm, access control, electric fence, etc.) only becomes effective if scaled to 24/7 operation even if power fails . Hence the need for UPS . In the case of a CCTV system, all cameras*, DVRs or NVRs, active signal converters, switches and other equipment that requires a power source to operate must be connected to the UPS system. * Solution valid for 12 VDC cameras only. Basically, an UPS (Uninterrupted Power Supply), is installed between CCTV system power input and the power outlet. In addition to providing power to equipments, UPS also charges a battery bank. When occurs an interruption in the power supply, UPS immediately start to use the batteries bank to continue supplying power to the system. How to calculate UPS powerFor each equipment multiply the supply voltage by the current consumption.Example: 12 VDC, 0,5 A camera = 12 x 0,5 = 6 W 12 VDC, 3 A DVR = 12 x 3A = 36 W Therefore, a DVR with 16 0,5 A cameras consumes 36 + (16 x 6) = 132 W To obtain UPS minimum needed capacity in VA , divide 132 by 0.7 = 188 VAUPS power should be sized according to the consumption of equipments in VA ( Volt - Ampere ) . For example, a 600 VA UPS is enough to power a set of computer / monitor / printer. When UPS starts to use batteries to provide power for equipment obviously they begin to discharge. Time batteries lead to discharge, suspending power supply, is called UPS autonomy . UPS for computers - most of them with internal batteries - usually have an autonomy of about 15 minutes, more than enough to save your work and shut down the computer, for that is their goal : Avoid your current job from being lost due to power loss. This reasoning does not apply to a security system, that must remain operative until power supply is restored . What is suggested is an autonomy of at least 10 hours, more than enough for most situations. In this case, UPS often use a bank of external batteries due to higher current capacity required. -Off-line UPS, simpler and cheaper. - On-line UPS, more sophisticated and reliable, providing a basis for the solution offered here . Off-line UPS are the most commonly found in CCTV systems . For this UPS, an automatic switch is normally switched to receive mains power input passing it right to the equipment. In the absence of power this key switches to receive power from battery bank via an inverter circuit. In fact, this type of equipment could not be called UPS, as there is a brief interruption in power supply at the time of switching. So what better name for it would be short -break. However, for being very small, around 5 milliseconds, this interruption is eventually offset by power supply's electronic circuit of connected equipments. The problem is that a standby UPS under normal power supply conditions, ie most of the time, does not prevent daily voltage fluctuations, which decreases equipment's lifetime. Therefore it is recommended more for small office and home equipment. Double conversion UPS is so named because electrical power input, that is AC (alternating current) is converted into DC (direct current) and reduced to 12 V to power batteries. Batteries in turn, are connected to an inverter circuit which reconverts 12 VDC voltage in AC again, also bringing it again to the level of the input voltage (110 VAC in the example below) . As sinusoidal voltage is regenerated in the converter, its waveform is clean and quite stable. Much better than the power supplied by the power outlet. For this reason, this type of UPS is mostly used in critical applications such as servers, hospitals and other equipment that must operate 24 hours a day. CCTV systems also need to operate 24 hours a day and therefore they should also use this type of UPS but, for being too expensive* , ends up becoming prohibitive for CCTV applications. * Due to the higher complexity of its circuit, double conversion UPS can not has a competitive price when designed for lower power, more found in 5 to 10 KVA powers. As noted above, for lack of more viable option, security systems are using offf -line UPS, which are not suitable for 24/7 applications. Best solution would be using something like an on-line UPS, but at a cost equal to or less than an off-line UPS. That was the challenge. A fact that caught my attention is that equipment used in security systems (cameras, access controllers , sensors , etc.) have a distinctive feature compared to other types of equipment : They are powered at 12 VDC (except 24 VAC cameras), or always there will be a 12 VDC power supply connected to UPS output. e. Circuit 3, which is a 12 VDC power supply, converts 110 VAC back to a 12 VDC voltage. If security equipment works with 12 VDC, so why do you need an inverter? To again transform the 12 VDC voltage into 110 VAC then turn it back to 12 VDC? Why not power the equipment directly from the battery, eliminating the circuits 2 and 3? It would end up in a much easier and more efficient UPS. As electronic circuits are not 100% efficient; some of the energy that passes through them is dissipated into heat. Thus, the fewer circuits have, more efficient, economical (lower power consumption) and ecological will be the solution. Instead of an UPS and a power supply, just a battery charger would be enough to perform the same functions. As this is not my specialty, I asked for the help of a colleague, an electro technical engineer who is considered one of the best experts in batteries in Brazil. - Any power supply can be used as a battery charger, since its output is adjustable and is set to the charging voltage of batteries. A good suggestion are those power supplies which are offered with capacities from 5 to 30 A and its output can be set between 10.6 to 14 VDC through a trim pot. - Voltage of each element of stationary batteries varies from 1.75 to 2.25 VDC . As are six elements , the power supply trimpot (V ADJ in the picture above ) should be set to an output voltage of 13.5 VDC . WARNING: NEVER USE AUTOMOTIVE BATTERIES IN UPS! - The best operating conditions for a stationary battery is when equipment connected to it consume up to 10 % of its total capacity, which gives a battery life of 10 hours, very reasonable time to maintain a security system in operation during a power loss. - Battery bank should work with a clearance of 70%, as there is no guarantee that batteries will be at its maximum load when a power outage occurs. For example, if the sum of the current consumption of DVR plus cameras equals 5 Ah, so to battery bank works providing 10% of its capacity, it must be at least 10 x 5 Ah = 50 Ah. But to have a clearance of 70 % => 50 Ah / 0.7 = 71.42 Ah. - Dimension power supply to work with up to 80% of its maximum capacity, so that its lifetime is not compromised. For example, a 10 A power supply shall operate with a maximum load of 8 A. A power supply as a battery charger? At this point you must be thinking: - It's not gonna work! When battery is fully charged, power supply will keep sending current to it, which will end up burning the battery! Electrical current only flows when there is a difference of potential between 2 points. When battery is charged, it will be with a voltage of 13.5 VDC, which is the same voltage of power supply. If tensions are identical, electric current will cease to circulate between power supply and battery. That's why it is extremely important that power supply output is set to 13.5 VDC . The load current (sum of the equipment current consumption ) plus the battery charging current must not exceed 80% of power supply's current capacity. On the other hand, for a 10 hours autonomy, consumption of the load times 10 must not exceed 70 % of battery bank capacity ( 2). Then, by adding all the current consumption of equipment to be fed, we will know load value L, which is applied in equation (3 ) to inform the minimum capacity of power supply. To know battery bank capacity, enter load value L in equation ( 2). Therefore, this system must use a 30 A power supply connected to a pair of 65 or 70 * Ah batteries connected in parallel. * PLEASE NOTE: Always choose a capacity of batteries equal to or slightly higher than the value obtained in the calculation. 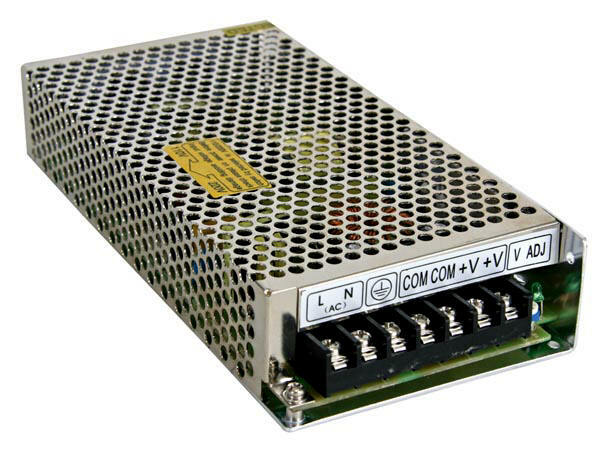 Suppose you have a 10 A power supply left, that you would like to use as an UPS . How to calculate which is the maximum load current that it can support and the capacity of batteries that have to buy? Therefore, a 10 A power supply charging a 50 Ah battery can support a load of up to 3.29 Ah for 10 hours. This setting should be enough to supply, for example, a 4 channels DVR with four cameras connected to it. Redo the calculations of Example 2 for 20 and 30 amps power supplies.. Doing that you will know in advance which UPS configuration you should use for your next projects. Installing stationary batteries Manufacturers recommend that stationary batteries should be installed in environments with temperature control (air conditioning), as its standard operating temperature is around 77° F (25° C). The lifespan of a stationary battery is halved for every 18 Fahrenheit (10 Celsius) degrees above the standard temperature . The use of AGM technology (absorbent glass mat), which prevents leakage of electrolyte, allows some stationary batteries to be mounted in lying position, on shelves, saving floor space in the room. - More economical, ecological and efficient than the configuration with the on-line UPS, it has two circuits less. Of course, this solution can only be applied to devices that work with 12 VDC voltage. However, except for 24 VAC cameras, some PC-based DVRs or top of the line stand alone DVR's, most of the equipment used in security systems work with this tension. Why you should not use automotive batteries in UPS 1 - Voltages are different. Stationary batteries are formed by cells of 2.25 VDC each, a total of 13.5 VDC for 6 cells. Car batteries are made up with 6 cells of 2.4 VDC each for a total of 14.4 VDC. 2 - Automotive batteries, even sealed, release toxic gases (hydrogen and sulfuric acid vapor) that scatter under the automobile hood. But UPS are usually installed in the security room, sharing the same space with system operators. 3 - Automotive batteries are designed to be always fully charged, around 90-100% of full capacity, function performed by the alternator. When a power outage occurs, UPS batteries are submitted to a discharge regime that was not expected to be supported by automotive batteries. Another thing that was not foreseen and that will compromise your car's battery life is you leaving the stereo on at full volume for several hours with the car stopped... Stationary batteries are designed for deep discharge cycles, reaching 20% ​​of its total load without compromising its life time. 4 - In automotive batteries, plates are immersed in a sulfuric acid solution so it is very important to keep agitating this solution, what happens when vehicle is moving. If used in UPS, the lack of agitation will cause this solution to sedimentate, affecting battery's life. 5 - For the reasons explained in paragraphs 3 and 4, most automotive battery manufacturers usually give 12-18 month warranty for automotive use and only three months for stationary use. The following was transcribed from an automotive battery user's manual: "Batteries used in stationary system such as:. TV power, Radio, Stereo, etc., will be guaranteed for only 3 months from the date of sale" 6 - Automotive batteries have an average life of 2.5 years. Stationary batteries last an average of six years. 7 - Automotive batteries have to be mounted on the floor side by side, which occupies much floor space in the room. Stationary batteries can be mounted lying on shelves, occupying a much smaller space (check with the manufacturer to see if the battery you are purchasing meets these conditions).